WASHINGTON—Quickly crumpling up all 500 pages of the legislation upon hearing footsteps in the hallway, sources reported Tuesday that a panicked Senate Majority Leader Mitch McConnell shoved the entire Senate healthcare bill in his mouth as a Democratic senator walked past. According to witnesses, McConnell became visibly flustered upon realizing there was no place to hide from the Democratic colleague approaching his doorway and began ripping wads of documents from a binder and cramming them through his open jaws as rapidly as possible. 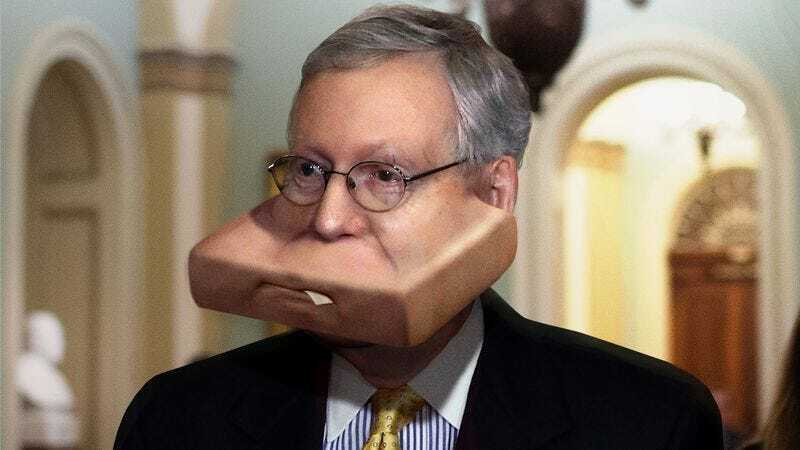 Asked about the location of an upcoming meeting, McConnell, cheeks distended to many times their original size, reportedly grunted several times and gestured toward a nearby conference room. At press time, McConnell had spit out the massive clump of saliva-coated, half-chewed papers, which, while largely illegible, would reportedly insure 10 million more people than the original.